In this article I am divulging 3 startup mistakes to avoid like the black plague. These start up mistakes cost me money and time. I am sharing how you can avoid them to save yourself a ton of headaches! Time is invaluable as an entrepreneur. Being able to stay laser focused on your goals is the quickest way to ramp up. I am divulging and sharing with you 3 huge mistakes that cost be time! I want to help you not make these costly mistakes… so that you can ramp up quickly and reap in your success. While starting up my business I was determined to launch my website. In my mind I needed a website to validate that I had a “real business” and I needed to have this done as soon as possible. I made two crucial mistakes when I launched the site. 1. It wasn’t SEO friendly. 2. It wasn’t speaking and targeting my ideal customers. What was missing from my website that was crucial to have? Search engine pages are yahoo, google, bing, etc. 1- “Quality”- attracting your target customers to your page. Individuals that have the highest likelihood of purchasing from you. 2- “Quantity” – LOTS of your target customers finding your website. The more traffic allows you to rank higher on a search engine query. 3- “Organic Searches”- this is how your customers will find you for FREE. If you are a florist in Atlanta, they would find you on the first page of a search engine (yahoo, google) under the keywords: Florist & Atlanta. Having lots of potential customers finding you for free is what you want! Who wouldn’t want that?! How can you avoid this start up mistake? 1. Website content needs to be keyword specific. Keywords that your customer would be searching for to find your services/products. 2. Website content should be targeting potential customers within your market niche. Keywords- if you are a small business using long tailed keywords (3-6 words) is optimal. I don’t use “brand strategy” as your keywords. There are too many large companies that use those keywords and it would be difficult to outrank them. SiteMap- make sure you have a sitemap, if you have a plugin such as Yoast SEO you won’t need a sitemap it has it built in. 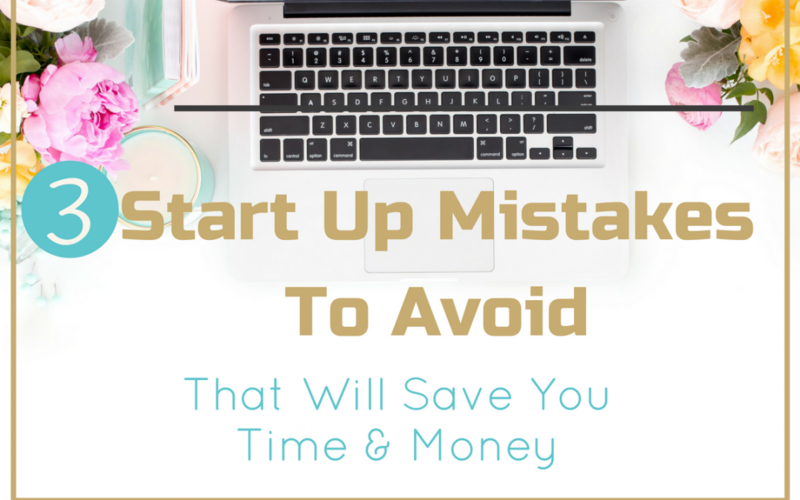 What to look for to avoid this start up mistakes! The above tactics are great for beginner level SEO especially writing blogs! Discuss and layout your target customer base. Prompting you to research demographics, interest and other brands that they are purchasing. This will help you in writing content that directly speaks to them! Keep in mind your brand strategy isn’t just the aesthetics. As exciting it is to design your logo and pick the colors of your website. Brand strategy encompasses every single customer touchpoint of your brand. When you are thinking about your keywords think along the lines of: What are you offering to help solve your customers challenges? What pain points do you help with? How can you connect with them like an old friend? The second start up mistake to avoid… we are still on the website. This one you’re either in the know or not! When I launched my website my Brand Strategy was to work with local small to midsize companies. To launch courses you need an email list… a list of individuals that you have earned their trust, added value to their lives. Guess what I didn’t have? Yep! I didn’t have an email list nor did I have an email software hooked up to my website. If you are laughing right now… so am I! What a rookie mistake right?? Have you ever noticed that every single company wants your email address? If you go on any major companies website they are offering you an incentive for your email address. 15% off your first purchase. Or free shipping. Why? Because they are able to market to you for virtually FREE. You have signed up with them, they are able to track your sales. Send you emails based around your preferences to get you to buy MORE. That 15% off is a drop in the bucket compared to long term sales through email marketing to you! I have an awesome blog on why your email list is the most important aspect of any business and how to start growing your list today! Check it out here! This last start up mistake to avoid will impact anyone that is working with one on one with clients. I started taking on clients when I launched, but didn’t have any set systems in place. I didn’t have an on-boarding questionnaire. I didn’t have workflow procedures. I didn’t set boundaries for communication or expectations. I was all over the place. My clients were seeing progress and marketing returns. However, I was flustered and disorganized. Having set systems in place is crucial for long term success. Having set questions and their branding guidelines that you gather before launching into work is crucial. I wouldn’t have had to go back and forth with random questions here or there. That delayed progress and killed my time management. Having all of their brand information, short term and long term goals… would have saved time and money! I finally got it together and figured this out! I created an on-boarding kit! I laid out their goals and created a roadmap of how we would achieve them. I set deadlines on tasks. I created a sheet to show progress and analytics that they received monthly. I designated large chunks of time on specific days to work on projects. I became efficient and was able to grow my business! If you are working with clients, my advice is to sit down and make an on-boarding kit. Lay out how you communicate and project deadlines. Have all their brand info in one place. This is going to save you time & money. Stop allowing clients to run your life. No more calling you late at night and randomly through the day! You won’t get enough accomplished! You’ll burn out working long hours and won’t make enough money! I have an article about productivity and how to take back your days. In this article I talk about interrupting calls and how they are decreasing your profits! Calls are those tiny time wasters costing you money! Imagine if everyday you have set calls, designated time to work on projects… I feel 4 day weeks coming on! Avoid these start up mistakes! I am sharing these mistakes in hopes to help one person not fall into the same pitfalls! Building Out your services/products to market demand. Creating buzz around your launch. No more launching to crickets! Click here for the next launch date. If you are interested in learning more, sign up here for our emails.